My Folks bought me my first camera, a Canon SureShot 35mm point and shot camera, back in the early 80’s and the photography seed was planted. Though I like a lot of what I took, it just lack a visual feel and taste to my mind’s eye that the works of the professional photographers stuff had. It took me a very short time to realize that sometimes equipment does matter and the quality was noticeable in comparison to my stuff. As it as the cameras and lenses I wanted were out of my means so I keep using what I had and enjoyed it. Then I bought a 35mm Minolta with a 50mm 1:1.8 lense for The Bride a few decades back but we never did get to tests it limits due to a lack of skill, time, etc. Fast forward a year or twenty and the photo bug bites me again. After a few digital point and shots I want to get a DSLR but funds are short, etc,etc,etc… Then I discover Sony has a DSLR that takes Minolta compatible lenses thought the old manual focus lenses you need an adapter. I bought me a Sony A300 and several AF Minolta lenses and have been noodling around with them over the past couple of years. In that time I have also acquired a few old lenses, manually mostly, and am now trying them out. So here is a weather worn flower through an old lense. In this case an old Vivitar 70-150 1:3.8 “Macro Focusing Zoom”. I like the muted affect. 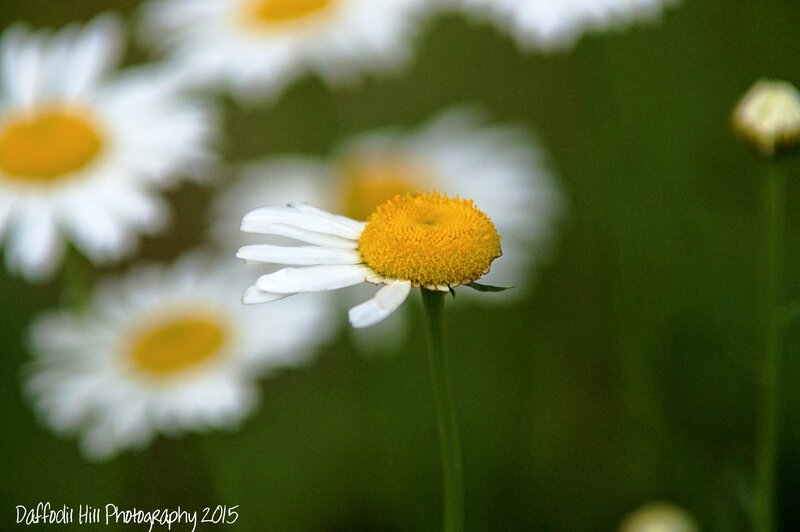 All eyes are on the imperfect daisy, standing alone and proud. Accepted by the group as “just one of the girls”.